Regiment/Catrawd: Loyal North Lancashire Regiment (9th Bn.) and Royal Flying Corps (18th Sqd. George Beaumont Bate was born into a long-established family of Wrexham brewers. His grandfather, Charles Bate, had established what became Messrs C. Bate & Son in 1840 and the business was subsequently run by George Beaumont’s father, George Bate and the manager, R. N. Woolett. The family had their own brand of beer and their name on bottles. 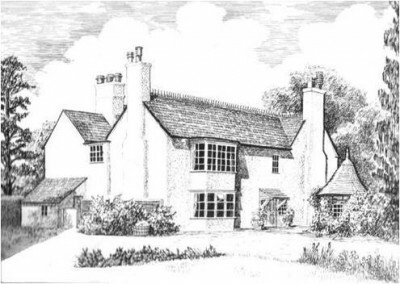 In 1901 5 year-old Beaumont was living in the White House, in Esclusham, Denbighshire, which had been once owned by William Rowe, engineer at John Wilkinson’s ironworks at Bersham and Brymbo. The census stating that he had been born in Bersham. His father, George, was listed as a 52 year-old brewer and employer, married to Millicent, aged 36. According to Findmypast.co.uk Millicent’s maiden name was Mills and the couple had been married in the second quarter of 1891 in Kensington. Daughters listed, in 1901, were Nesta B, aged 8 and Mary M, aged 7. The family employed Abina O’Riodan, a 23 year-old Irish governess for the children, Annie Thomas, aged 28 as Cook and Sarah Thomas, aged 23, as a domestic housemaid. By 1911 George Bate (aged 62) had retired as a brewer. Millicent (46), Nesta Beaumont (18), Mary Marjorie (17) and 4 year old Francis Beaumont Basil were present in the White House. The family was assisted by two locally born ladies, Mary Williams, a 20 year-old domestic cook and Sarah Jones who was a domestic house maid aged 19. George Beaumont himself was aged 15 and was living as a student in Downside School, in Bath, Somerset, a school founded by Benedictine monks from Flanders in 1814. The census listing for the school shows that 16 Roman Catholic Priests and 13 Ecclesiastical Students or undergraduates were also in residence with the scholars. 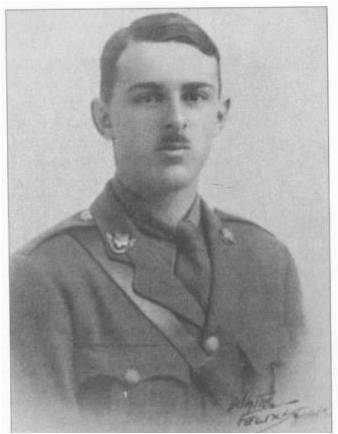 George Beaumont Bate has been remembered in Downside and the War (Hudson and Kearns, 1925) by Dom Lucius Graham, OSB which gives his period of education as 1909-1911. His sporting achievements included playing in goal for the school hockey XI. 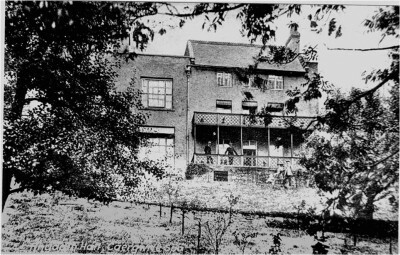 In 1907 Roe Brown sold Rhyddyn Hall and 80 acres of land, including the wells, to a syndicate represented by R. N. Woolett of Wrexham, who was the managing director of a brewery Messrs C. Bate & Son, Wrexham. This syndicate developed the wells as an outstanding tourist attraction. 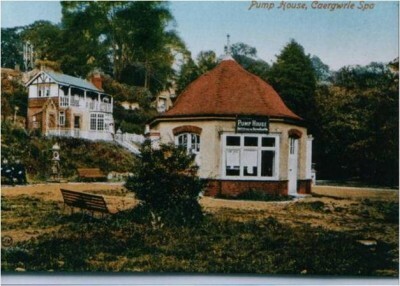 Photograph of Pump House, one of the features developed at the Caergwrle Spa site by the syndicate of Woolett and Bate after 1907. The Roll of Honour Card, held at Flintshire Record Office, gives the address of George Beaumont Bate as that of Rhyddyn Hall itself and it may be that the family expected him to play a role in the future development of the site. 0n 18th May 1917, however, the County Herald reported that Lieutenant Bate, son of Mr Bate of Rhyddyn Hill, had been killed in action. The Bate family link with Caergwrle, and therefore Flintshire, is therefore established. Rhyddyn Hall was developed as an eight-bedroomed residential hotel. According to information provided by the Commonwealth War Graves Commission George and Millicent Bate subsequently retired to 51, Colville Gardens, Bayswater in London. Second Lieutenant George Beaumont Bate from “Under the Guns of the German Aces” by N Franks and H Giblin which is available as an e-book. Written shortly after the conflict, the notes put their own ‘spin’ on events, failing to say anything negative about the engagement of 23rd April and they are silent about the conflict of 29th. Not only was it the day George Beaumont met his fate it was also the worst day in the aviation history of the Royal Flying Corps as it came under attack from a hunting squad led by Manfred von Richthofen, the Red Baron. On 26th September 1915 George Beaumont will have been with the 9th Battalion of the Loyal North Lancashire Regiment when it mobilised for war and landed at Boulogne. In the course of 1916 its soldiers were engaged in various actions on the Western Front, particularly those associated with the Battle of the Somme. ‘Two winters in the trenches’ will have acquainted George Beaumont with the harsh realities of the conflict on the Western Front. He may also have developed an insight into the value of informed intelligence about enemy positions, which was becoming available through aerial reconnaissance. Bate and his pilot both claimed to have shot down one of their attackers before they, themselves, were forced down. Although Bate was unharmed, a machine gun bullet ploughed a furrow through the cloth of his tunic and the leather of his flying suit. 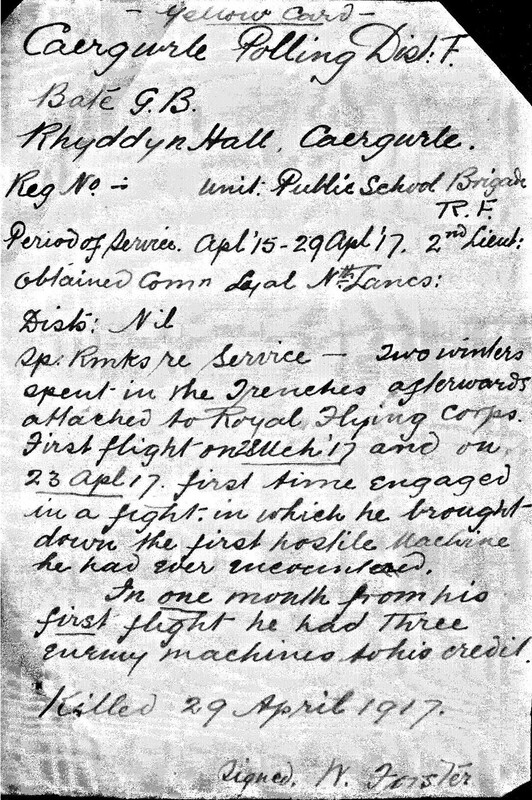 Second Lieutenant Bate’s luck was to run out just a few days later on 29th April. 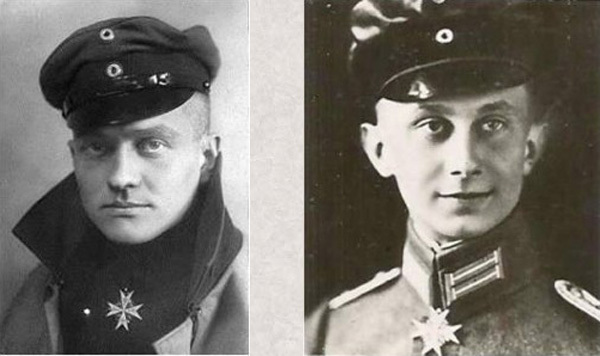 Manfred von Richthofen, the notable German flying ace, would later claim the 29th April to be his ‘record day.’ He was leading a squad called Jasta 11. His own account of the day makes it clear that they were ready for the hunt. The weather was glorious and Richthofen arranged for a spectator, who had never seen a dogfight, to have a telescope so that he could have a good view of the anticipated action. In the evening we could send off the proud report: “Six German machines have destroyed thirteen hostile aeroplanes.”….The hero was a Lieutenant Wolff, a delicate-looking little fellow in whom nobody could have suspected a redoubtable hero…. My machine engaged three of the enemy. One circling in front, one coming from top and rear and one from beneath to the rear. My observer (Bate) fired about thirty rounds at the front. He motioned to me to pull up the nose of the machine and then engaged the top rear machine. This was evidently hit and dropped out of the fight….At the same time the bottom rear machine fired a heavy burst from below. My observer fell over and the rear gun, instruments, etc., were all hit. The left aileron control snapped at the control lever and I dived for our lines, side-slipping to avoid further shots. I crossed the Hindenburg Line at 500 feet and landed. I was followed down by the remaining HA (hostile aircraft) to within 100 feet of the ground, but it was driven off by rifle and machine-gun fire from our lines. The machine was at once brought under enemy machine-gun and artillery fire, but a detachment of the Border Regiment secured the body of my observer who had been killed instantaneously. Twenty-one year old George Beaumont had been shot through the heart. He was the third victim of the day of Lieutenant Kurt Wolff. He was originally buried about 3000 yards north of Beaumetz-les-Cambrai, but he was re-interred after the War in Quéant Road British Cemetery. Wolff would go on to shoot down 33 enemy aircraft before he himself was killed in September of 1917. Richthofen would chalk up 80 before meeting his own doom at the age of 25. During the month of April 1917 the British lost 245 aircraft with 211 aircrew killed or missing and 108 as prisoners of war. The German Air Services lost just 66 aircraft from all causes. However, defenders of British strategy argue that the sacrifice made by members of the RFC served an invaluable purpose. Up-to-date aerial photographs and reconnaissance information provided support for the army throughout the Arras offensive so that British artillery maintained its superiority. Second Lieutenant George Beaumont Bate deserves to be remembered as one of Flintshire’s aviation heroes during the First World War.